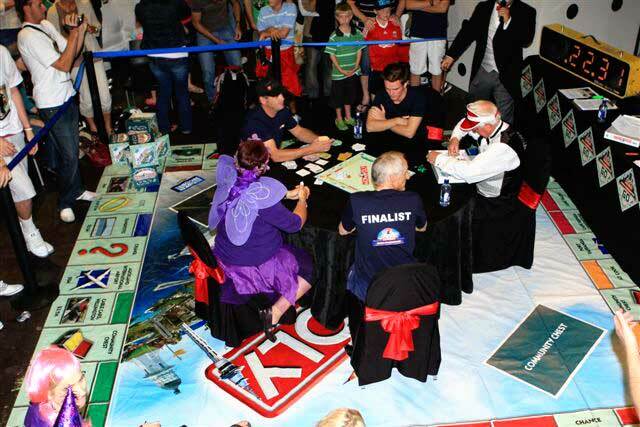 Sitting on a giant Monopoly board, four finalists and a banker (in red eyeshade) battle for supremacy in the national Monopoly championship in Auckland, in 2009. The winner was 25-year-old Aucklander Geoff Christopher (arms crossed at rear). Christopher went on to represent New Zealand in the world championships in Las Vegas, losing narrowly to 19-year-old Norwegian Bjorn Knappskog.